In 2007, the job market was not as dire as it would become, but it was already tumbleweeds in the tech sector in Southern Virginia. I relocated to Austin, Texas where tech was (and is) booming. I had a job within a week, but I had no friends in my new town. That’s where blogs filled a gap, giving me access to the intimacy of friendship without geographic constraints. I discovered several writers’ blogs, and anticipated their posts with the giddiness of afternoon coffee with a good friend. It would be another four years before I started my own blog. In the intervening years, I lurked rather than commented because I felt weird with how lopsided our “relationship” would be, given I wasn’t blogging. I learned about the illnesses, the envies, the fears, and the joys of many writers I’ve never met. Sadly, none of continue to blog. I wonder what happened to them. Did life crush them with obligations, commitments, or depression? Did they move to a new blog with no backlinks to avoid a troll? Are they dead? I had a writing mentor at that time. We met in Zoetrope’s Virtual Studio, a forum for writers to critique other writers, rank them, and possibly get a story picked up by Zoetrope for their lit magazine. Most of the writers were newer than I was to the craft, and I lucked into finding IJJ, who was a very experienced writer. At one point, he sent me a physical copy of a story of his published in The Paris Review. (Yes, mind=blown!) IJJ never wavered to tell me when I’d edited out the heart of my story. He called me on my BS and also told me where my writing shone. IJJ was in his sixties, and there were intimations of health issues. The last time I heard from him was in 2007, and he was moving to a new home in the country. He reminded me that while we put ourselves into our writing, strict adherence to our personal reality can diminish the impact of the story. I wrote back, and he never responded. I tried again last week, even knowing his email address has been disconnected for years. He hasn’t logged in at Zoetrope or any other known haunts in the last seven years. I think that he is dead. I am sorry that I don’t know for sure. What I do know is that my writing is better for having his influence. I hope that he knows that. There are many other writers I’ve met that have disappeared. They stopped blogging, stopped commenting, stepped away from the community. I wonder where those lost writers are. I wonder if they are still writing, and if their silence means they are working on the next Great Novel. I hope they aren’t sick, dead, depressed, or utterly gone from writing. I miss them. I understand disappearing. I disappeared physically from Virginia, choosing to start fresh without leaning on any of my former friendships. Later, I disappeared from the online writing community, not even connecting with the people in my writing guild. I know what happened to me. In both cases, I felt too raw to connect, too vulnerable. I retreated into isolation because I didn’t know how to cope with what felt like Really Big Things: job loss, shattered dreams (I wanted to be a philosopher of science, imagine that! ), broken friendships, living in a new place, the fact that self-publishing wasn’t what I thought it would be, and later, that submission to traditional publishers was what I thought it would be. There are a lot of situations in life that are overwhelming. My coping mechanisms were faulty, and they left me isolated. I’ve learned new ways to deal with life, and they’re working for me. I banished artist’s envy. I got out of the ambition room, and stopped striving for success that didn’t thrill my soul. I seek fellowship with others on my path. I embody gratitude. I’m entering into a more spiritual mode of coping. I’m no longer one of the lost writers. I’m busy writing a guide explaining the precepts I followed to get to where I am now: happy, peaceful, excited about writing. It’s called Bring Your Joy: A Code for Creatives. I know it can’t bring back IJJ, RIP. I know it probably won’t ever reach the bloggers who pulled me through the loneliness of 2007, and have since disappeared. It might reach you, though, and be of some help. When it is ready, I’ll announce the release of Bring Your Joy. The guide will be offered as a free PDF download. Expect it within the month. If you’re in dire need now, though, leave me a comment, and I will get you a rough-draft. It’s that important to me to share the message. If you are a writer or blogger who has gone away from the community, know that someone misses you. We wonder where you are. We hope you are okay. Welcome to the launch jubilee for my surreal short story, MIXED MEDIA! This is the first in a series of posts to celebrate publication, and no celebration is complete without a door prize! Click the Rafflecoptor button to enter for a chance to win a $25 (USD) gift certificate redeemable at Art.com! Mari Biella, my friend and author of THE QUICKENING and LOVING IMOGEN,continues the launch festivities on her blog. In my guest post, I discuss the inspiration for MIXED MEDIA. In this passage, Mario discovers that he can no longer see any art in the gallery when he is by himself. He has just emerged from the Visiting Exhibit, stunned by the nihilism of a display consisting of several canvases apparently painted black. The Contemporary Art exhibit was in the next room; it was well-lit, and the floor creaked with familiar goodwill. Color exploded from the canvases, brighter than a Technicolor dream. O’Keefe’s southwest yellow-orange-red swelled near Rothko’s angular green-blue-brown. It was all as I remembered it, as colorful and mind-expanding as I remembered — and then it wasn’t. The encroaching black slid over the Contemporary masterpieces. The yellow-hued Ashley to my left went blank. There was no yellow on the canvas. No yellow, no red, no green-blue-brown, not even a pastel. Just black. The Vos Modern Art Museum isn’t a real venue. This allowed me to gather the pieces that spoke most deeply to my story under one (imaginary) roof. I chose the Rothko because there is something about the shading in the blue that leads me to imagine distant pine trees shrouded by a midwinter night. The brown and green beneath promise Earthy rebirth, and this symbolizes Mario Santa Maria’s situation. Mellow Yellow II invokes thoughts of ripe wheat fields, and the idea of harvest. This, too, represents Mario, specifically his quest to understand the purpose hidden in his strange new ability, which first manifests just after the passage included in this post. O’Keefe’s flower conveys a sensual richness that represents the flowering of Mario’s understanding. The images included in this post are courtesy of Art.com, where you can purchase prints of these works, and thousands of others. My DIY Book Covers Win & a Poll! WAY cheaper than paying for individual cover designs. This weekend, I took some time to get to know my DIY Book Covers. I was nervous, but I needn’t have been! In a very short time, I was able to craft multiple versions of a cover. The templates are easy to use, and the Cheat Sheet guided me through the steps to get started. I chose a template for my surreal short story, followed Derek’s Font List to determine the font to use, downloaded and installed the font and, voila! 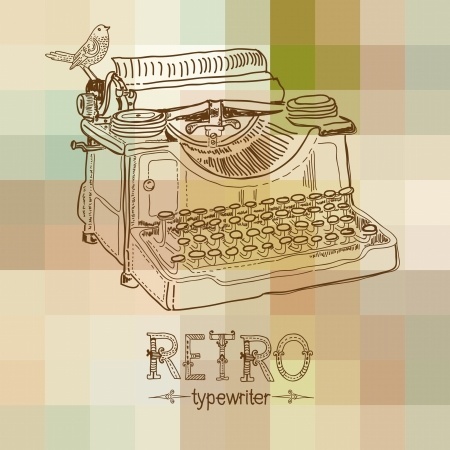 I was a cover designer! It really was that easy and way more fun than I expected. I spent hours sifting through images on my favorite stock photo site, 123rf.com. Replacing the image Derek chose in the template with comps from 123rf was simple: right-click the image, and pick “Change Image” from the menu. Friends, if I can do this – and I can’t even figure out how to match shoes to my outfits – YOU can do this, too! In the poll, you can see a few of the options I tried during my play date with DIY Book Covers. The images I used are all comps. Comps contain a watermark and are of slightly lower resolution than the purchased images will be. The images in the poll are from the designer view of Word, and so you can see the grid lines. Bearing all of that in mind, I’d like your help choosing which of the covers I use for my surreal short story, MIXED MEDIA. Please take the poll. 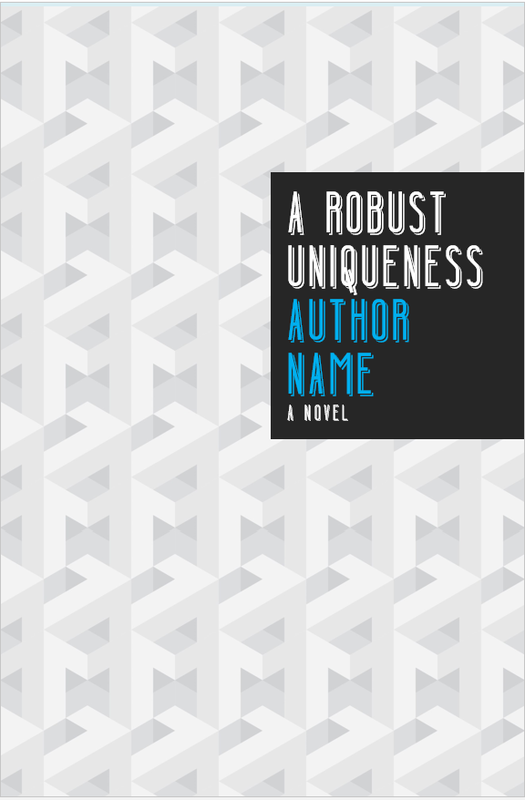 You can click the thumbnails to see larger versions of any book cover. If you have suggestions or feedback, leave a comment and let me know. Thanks for helping! Click Me to Tweet about this post! EDIT!!! Today is February 23, 2016. I published this post in May of 2014, and a lot of people have written to tell me how useful and helpful it was to them. That is awesome! Even more awesome, though, is that WordPress.com now offers a widget to embed a Mailchimp Subscriber Popup. Here are some excellent instructions on how to use it. I would recommend trying that first, and then using the instructions I have here as a back-up plan. Good luck! The true gift of having a clearly defined definition of success is that you begin to find exactly what you need to achieve that success. I discovered YOUR FIRST 1000 Copies by Tim Grahl exactly when I needed a guide for book marketing. I want to get the word out about my books, and I want to do it without being subservient to a cumbersome system I neither understand nor enjoy. Grahl gives me a blueprint to achieve that, and having a newsletter is an integral element in his system. In this post, I share what I’ve learned about setting up a Mailchimp newsletter and integrating it into your (free) WordPress.com blog. I chose Mailchimp because I get newsletters from other authors using it, and those newsletters look nice. Plus, Mailchimp has stellar set up guides and knowledge base articles. They also offer a basic free account that meets my needs, allowing up to 12,000 emails to 2000 subscribers. CAN SPAM law requires you link your mass email campaigns to a physical address – if you don’t have this and you are reported to Mailchimp, your account can/will be suspended! Mailchimp’s free account doesn’t provide auto-responders to send automatic emails triggered by specific subscriber actions. This means you will not be able to easily send every new subscriber a series of emails, unless you set it up for each user yourself. It is something to consider when selecting a plan, as auto-responder “drip campaigns” are an effective marketing tool mentioned in Grahl’s book . 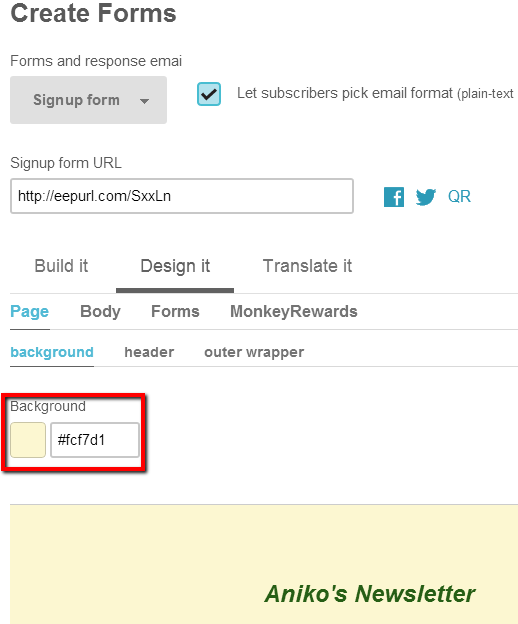 Follow the Mailchimp setup directions to Create and Import a List of Subscribers. This list is the “bucket” where all of your WordPress.com subscribers will go into once they sign up for the newsletter. The List Name you select is visible to subscribers, so take care to choose something descriptive and polite! Now the real fun begins! 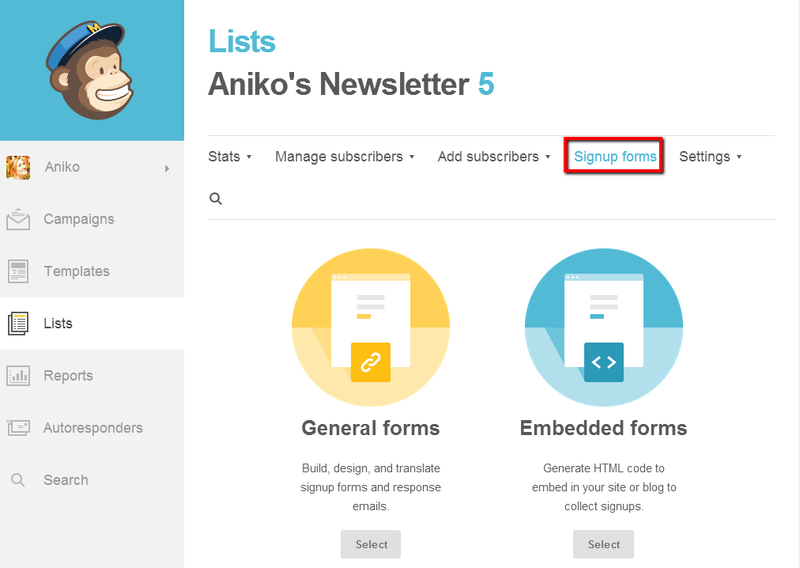 It’s time to build the signup form associated with your list! The signup form is your newsletter’s first contact with a potential lifetime supporter. As such, it should be clear on what is offered in return for signing up, and be respectful of the subscriber’s time. Remember that the more fields a person has to fill in, the more likely they are to decide not to subscribe. I started out with five fields, and have since altered my form to request only what I need (email and first name). I also left in the option to select Plain or HTML text, but if the subscriber is comfortable with the default (HTML), they need take no action. From the main Mailchimp page, select Lists in the left panel. Then select the list you created in Step One, and click Signup Forms (see image above). Click the General Forms button. 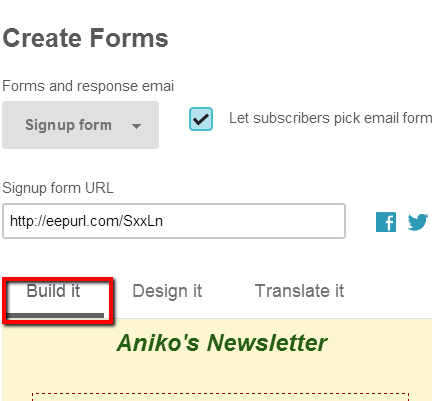 Once you are on the Create Forms page, select the Build It tab. On the Build It tab, drag and drop items from the right onto the designer area on the left. Don’t worry about the looks, we’ll take care of that in the next step. For now, just arrange the fields you want the user to enter the introductory text. Now that you have the content and fields defined, it’s time to make the signup form look like it belongs on your WordPress.com blog. To do this, I am going to show you how to use the Google Chrome developer tools to locate the hexidecimal value for the colors on your blog. You can use another browser, as they all have Developer tools, but my video will show how to use Chrome. The first step is to open your blog in Chrome, then follow the video. The Developer Tools open by default at the bottom of the browser. The left pane shows the elements on the page (links, titles, images) and the right pane shows the attributes associated with each element. By default, the background color for the page is displayed at the top of the left pane; go ahead and copy that value (or memorize it, if such appeals to you!). You can discover the hexidecimal color value for any element on the page by clicking the magnifying glass on the Developer Toolbar (far left). Click the element you want to know about on the blog page, and scroll down in the right pane of the Developer Tool until you see the “Color” section. You will know it is correct because there is a tiny square of color in the Developer tool that tells you the color associated with the hex value. The screen cast may be slow to load! If you click PLAY and the screen goes blank, please wait. When the entire video buffers, you will be able to play it without experiencing lag. Thank you! You can repeat the process to match the signup form font with the color of the font on your blog. Finally, if you want to discover a complementary color to use in your signup form design, the Color Hexa site is amazing. 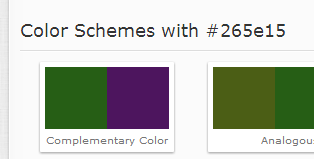 I used the complementary purple color to my green font to color the asterisk that indicates required fields. It’s a small detail, but remember: newsletters are where you get and keep loyal supporters! Not only does Color Hexa show you complementary colors (and their hex or RGB values! ), but it will also show you the values to use to get a darker or lighter tinted version of the same color. In my newsletter form, I used a darker tint of the background color to fill in the fields on the form to make them more visually pleasing. You are ready to go live with your newsletter sign up form! The final step is to add a widget to your WordPress.com blog and provide it with the URL for your newsletter. This will provide your potential subscribers an easy way to access the signup form, which is hosted by Mailchimp. First, copy the URL from the Lists -> Signup Forms page on Mailchimp. Open your WordPress.com blog dashboard. Go to the Appearance -> Widgets page. Drag a new TEXT widget into the Sidebar at the right. 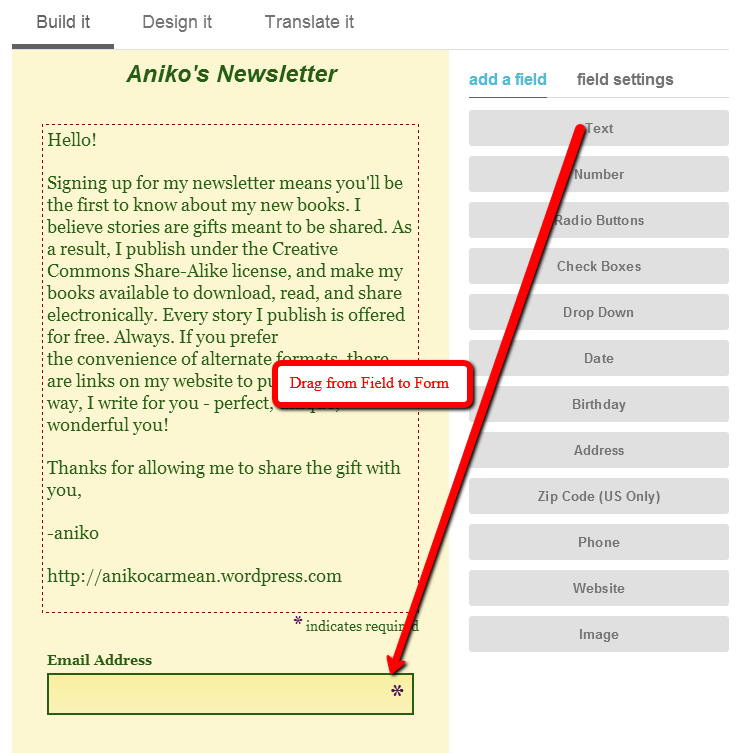 The green font “Subscribe to Aniko’s Newsletter” is the portion that was in the HTML added to the text widget. Note that if you copy and paste my example, to replace the “smart” quotes around the URL – the way they are rendered in WordPress will break your link if you do not replace them! Reload your blog, and verify that the link to the Mailchimp signup page works. Go through the sign up process, adjusting anything that feels strange or awkward about the setup. You are now the proud owner of your very own Mailchimp Newsletter, linked to your WordPress.com blog! My computer decided she needed (NEEDED) a trip to the Repairman’s Spa. When she is back, I will be back with more posts – including one about setting up a custom Mailchimp newsletter for WordPress.com blogs. See you soon!